They don’t simply donate and walk away… they roll up their sleeves and lend a hand. 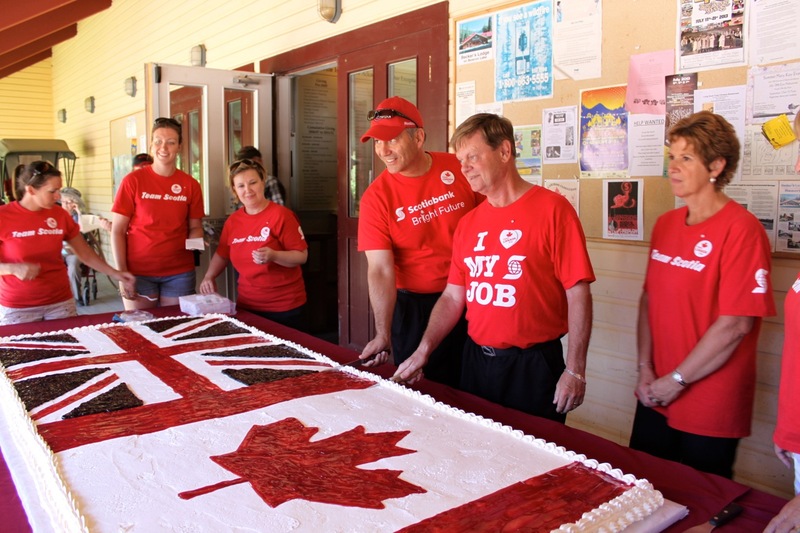 A cheerful crew of volunteers and managers from Scotiabank helped dole out the eight foot long ”Happy Birthday Canada” cake in Barkerville for this year’s Dominion Day celebrations. 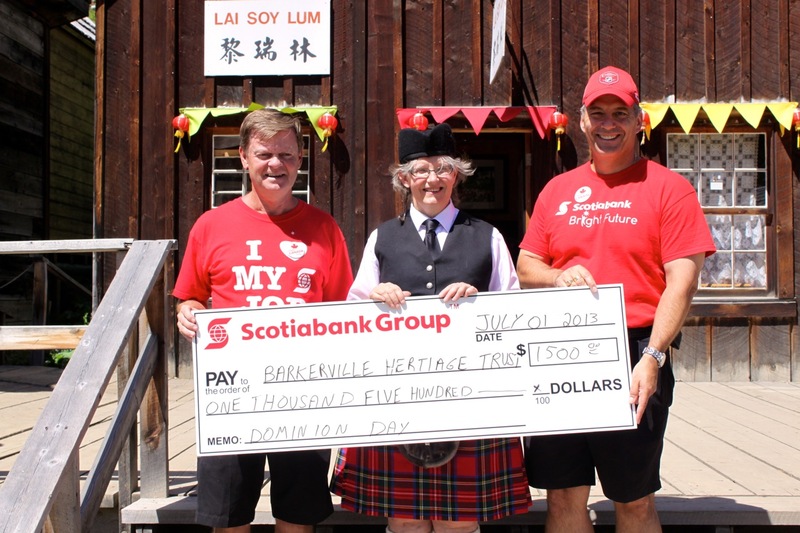 This is the fourth straight year Scotiabank has been an integral part of Barkerville’s annual Dominion Day festivities. “At Scotiabank we are proud to support Barkerville’s Dominion Day celebration and the deep heritage we have in Canada. Scotiabank proudly supports the communities we do business in.” said Brian Harrison PFP, the Branch Manager at Scotiabank in Quesnel. Many of the Scotiabank’s employees came out to Barkerville with their families, some of them camping at the nearby Barkerville campgrounds. Dominion Day activities in Barkerville reach all the way back to 1868 – before British Columbia was part of Canada. At the time, European and British members of the colony embraced the birthday of the newly formed Dominion of Canada in an attempt to trump the boisterous annual Fourth of July celebrations by American miners in Barkerville. Just after midnight on July 1, 1868, an anvil chorus woke the entire town. An anvil chorus is created when black powder is sandwiched between two anvils and struck with hammers. In Barkerville the noise echoing off the hills was described as building into a crescendo akin to rolling thunder.For the next few years the friendly rivalry sparked by the first Canada Day celebrations manifested itself in a flagpole raising competition with different nations represented in Barkerville each claiming to have the tallest in the region. Dominion Day in the historic town continues to be one of the most well attended events of the year. The donations from corporate sponsors like Scotiabank help ensure festivities continue.